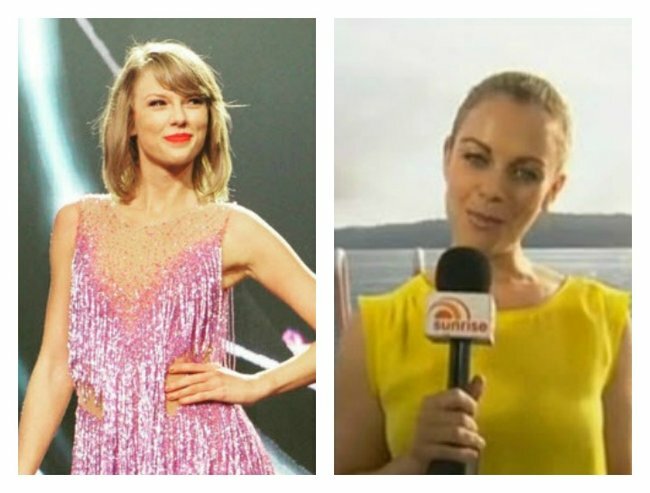 Taylor Swift boots media off Hamilton Island. 'Cos she can. Sunrise crew booted off Hamilton Island. You’re nobody until you have the power to kick people off an island. There was never any doubt that Taylor Swift had serious clout, but the 25-year-old superstar just took it to the next level. She managed to get a whole media crew banned from, and escorted off, a Queensland resort island. 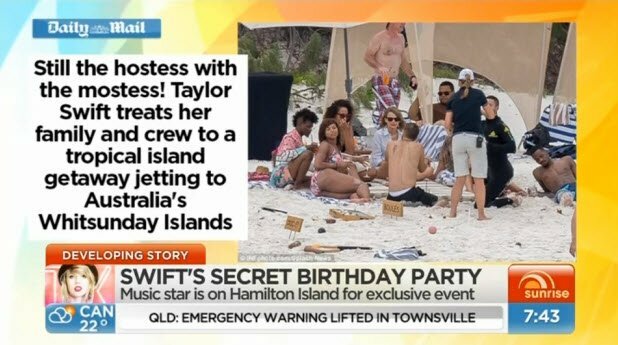 Swift, taking a well-earned break during her Aussie tour, is believed to be hosting a massive birthday bash on Hamilton Island with a few of her mates. The Daily Mail managed to get pictures from Hamilton Island. Screenshot via Seven’s Sunrise. The rumoured guest list includes the likes of Oprah, Ed Sheeran, Swift’s DJ boyfriend Calvin Harris and members of her exclusive Girl Squad, including Selena Gomez and Gigi Hadid. But Sunrise reporter Michelle Tapper got a rude shock yesterday when she discovered not only was she not on the list, but her name was on a very different one… a list of people banned from the exclusive island. Tapper, who recently returned from covering the Paris terror attacks, said she questioned the legality of the ban, but was told it was lawful because the island is privately owned. The owners apparently promised the American music sensation they would do everything possible to protect her privacy. “I’ve never encountered anything like this before in 20 years of journalism, this is a pretty outrageous media ban,” she said. After being escorted from the island, Tapper returned in a boat near the ritzy Qualia Resort at which Swift is believed to be staying. Despite security boats circling Tapper, she insisted lurking off the coast was entirely legal. The reporter was understandably miffed that other media representatives were enjoying the island sunshine. “I do know there are a number of journalists on the island,” she told Kochie and Sam during a live cross from the seas. “Thank you to Hamilton Island for taking such great care of 125 of the people who work tirelessly to make sure the 1989 World Tour stage gets built, the lights are on, the costumes are made, the guitars are tuned, and the show goes on,” Swift posted. Taylor Swift’s 1989 World Tour. Image via Instagram. With the petition Tapper started on her notepad looking unlikely to reverse the ban anytime soon, she may just have to watch from afar until then.